The southern part of Rose Lane was mostly undamaged during the 01/06/42 bombing raid. 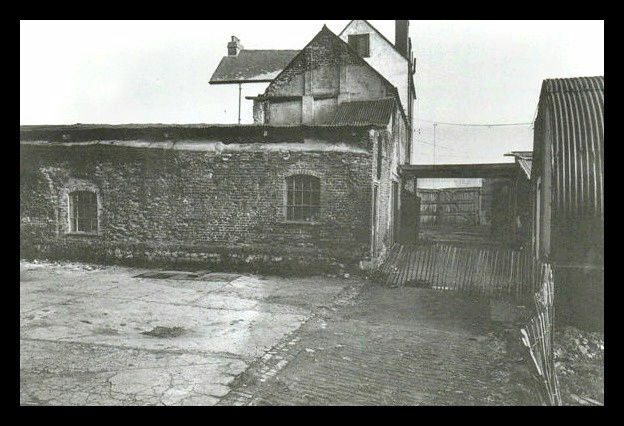 Philpot's Rose Lane Garage and other businesses associated with the motor trade industry plus coach building were located in the area. 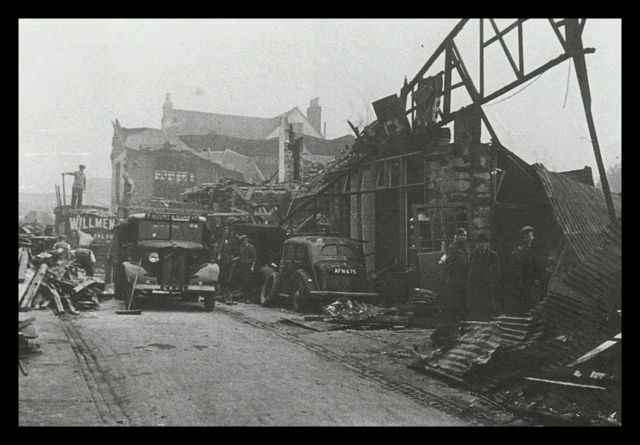 A tremendous amount of damage was done to Rose Lane Garage and other buildings during the 31/10/42 bombing raid. The Dean of Canterbury, Dr. Hewlett Johnson said, "I am sure the German bombers had taken notice of the places Mrs. Roosevelt had visited. They thought that if Canterbury was able to be visited by Mrs. Roosevelt it had better have another dose." One bomb fell only a few yards from a Women's Voluntary Services mobile canteen which Mrs. Roosevelt had visited the day before the attack. 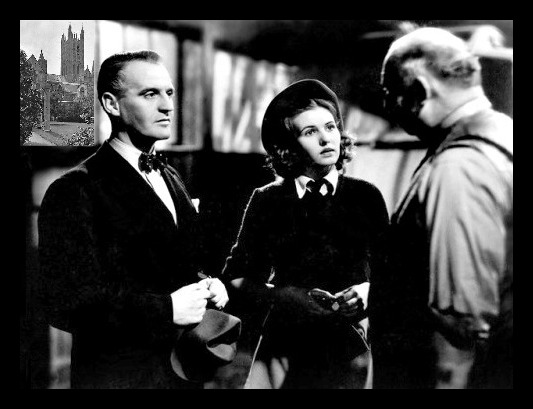 Perhaps Rose Lane Garage would not have been destroyed if the wife of the President of the United States had not visited Canterbury. 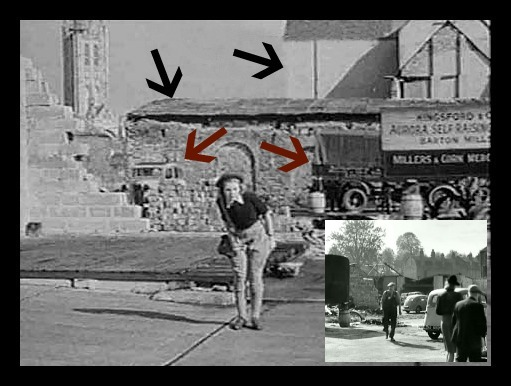 Right next to Rose Lane Garage was Marlowe Motors where Alison (Sheila Sim) meets Arthur (Parry Jones). The first BLACK arrow points to a low brick building which before being damaged by bombs had two levels. 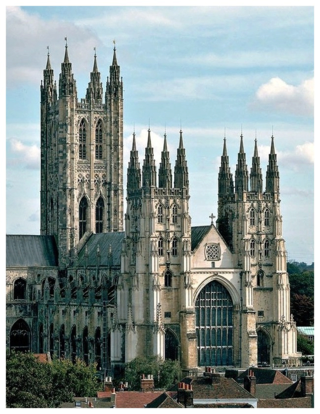 The structure was owned by Williams & Son coach builders and was used in A Canterbury Tale as the front entrance where Alison's caravan was being stored. The second BLACK arrow points to a white Regency period building on Gravel Walk. The RED arrows point to a car and a lorry which are seen again when Mr. Portal (Henry Maltby) walks to meet Alison and exits onto Rose Lane where two pedestrians are seen. However, Mr. Portal isn't shown walking through the already open front double doors, but instead he is seen inside with Alison and Colpeper. 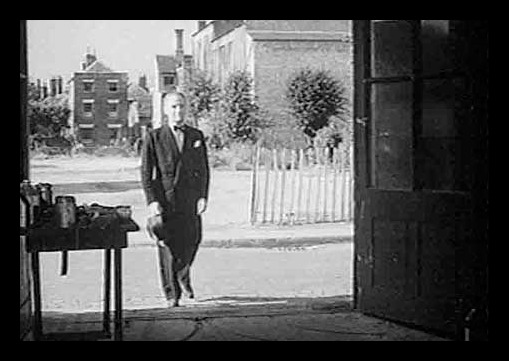 Colpeper (Eric Portman) is seen standing at the front entrance looking for Alison. 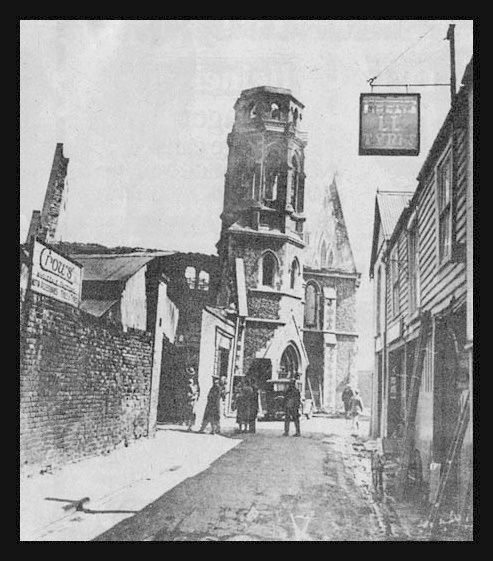 The distant building with three levels seen behind Colpeper is on the corner of Saint Margaret's Street and Hawk's Lane. Mr. Portal tells Alison that Geoffrey's father has been trying to get in touch with her. The majority of the interior scenes were filmed in Denham Studios. 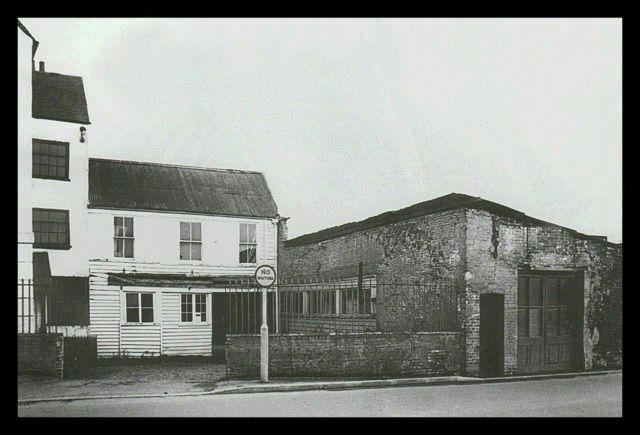 Many of the bombed firms continued trading in truncated or damaged premises supplemented with Nissen huts. Some of the "temporary structures" were used until the middle of the sixties. 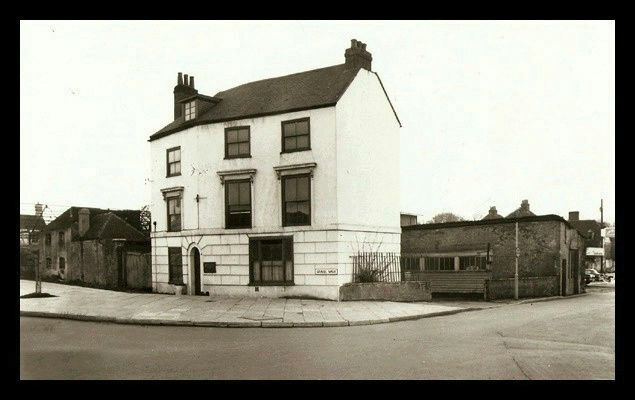 The empty space in the front of the photo was the location of the real Rose Lane Garage. The two buildings seen from Rose Lane. Note the distinct styling of the front double doors of Williams & Son coach builders where Colpeper was initially seen. The two buildings seen from Gravel Walk. 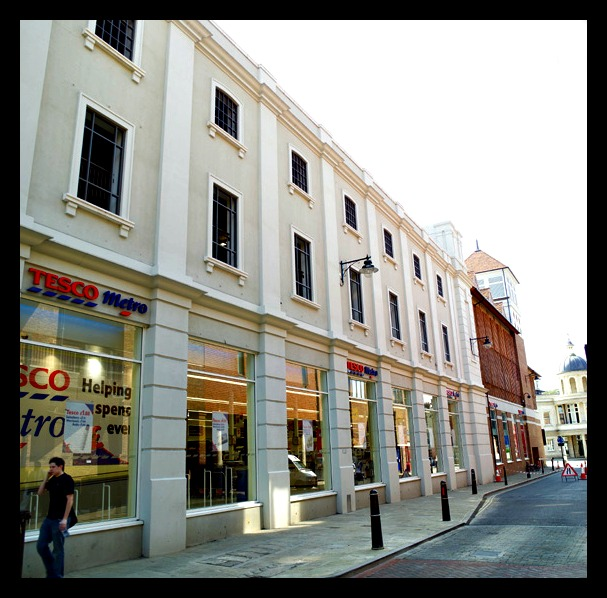 Today a Tesco store has replaced Rose Lane Garage. 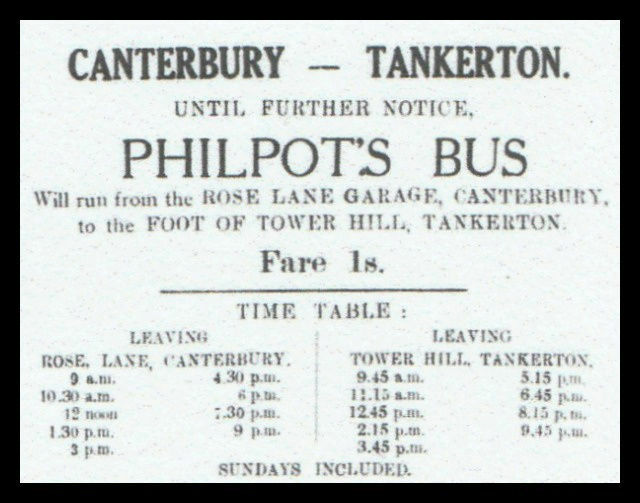 A local newspaper advertisement for a bus service from Rose Lane Garage.